Magda Haroun, the leader of the four-member Jewish community of Cairo, was in the US for a conference at the end of January. There she found time to answer questions from Viviane Levy at the Center for Jewish History in Manhattan. Later, she made a fundraising appeal at the University of Pennsylvania. See comments below by Levana Zamir, head of the organisations representing Jews from Arab countries in Israel. 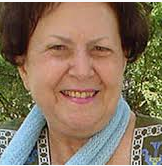 Top: Carmen Weinstein, former head of the Cairo Jewish community. Above: Magda Haroun, the present head. Pennsylvania, Philadelphia from Ben Gurion University. 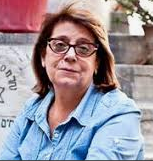 When her predecessor Carmen Weinstein managed the Jewish Community in Cairo, she had never set foot in the rooms where the official records and documents of the community were kept, according to Magda. Only Carmen's assistant (she called him "the gigolo") entered these rooms to look for documents. Again, according to Magda, it appears that this gentleman, instead of making photocopies, just tore out pages, scattered everything on the floor and never put the books or documents back in place. So, after Carmen's death, and that of Magda's older sister, Magda herself finally decided to take matters into her hands and went to inspect these document rooms. Everything had been turned upside down. Magda did not know where to start, so when the Egyptian Ministry of Antiquities offered her help, she accepted their proposal to put all the documents and registers in the building housing the Egyptian national Archives . "Everything there is watched and guarded, with cameras on 24 hours a day," she said. "I was afraid that if I had kept the documents in the office, anyone could have come in and set fire to them!" She gave assurances that the Egyptian government has enshrined in their constitution that the Ministry of Antiquities must protect synagogues and documents. In case of a change of government, and the arrival of another (Islamist) Morsi, she said, "As long as it's in the Constitution, everything is protected." Only four Jews remain. In spite of this, the Ministry of Antiquities insists on taking on the restoration of the 12 synagogues of Cairo. The Ben Ezra synagogue was restored in the early 2000s. The Rambam synagogue has been restored. They hope to finish repairing Sh'aar Shama'im (Adly Synagogue) and to reorganize all the books and put them in the basement of the synagogue to make a small museum. Professor Meital explained that he has just finished his expert's report and detailed plans of the twelve synagogues, including that of Daher, the Hanan synagogue, the Karaite, the Meir Bitton synagogue and the Ashkenazi synagogue. All the details have just been given to ARCE (American Research Center of Egypt). In mid-February the plans will be uploaded and accessible on the Internet. According to Magda, the synagogues will be designated "Historical Monuments of Ancient Egypt" /"Historical Monuments for Egyptian Antiquities." The next priority is to clean up the Bassatine cemeteries in Cairo. Magda and Sammy are seeking to put the cemeteries under the protection of what they call "World Monument Fund," like the cemeteries in Alexandria, she claimed. When asked point blank how many Torah scrolls and other Jewish artefacts are in the synagogues, and why they are not shared with the Egyptian Jewish community all over the world, Magda was taken aback. She claimed that all but a dozen were pasul (non-Kosher). She balked at the suggestion that any scrolls be shared out with synagogues outside Egypt, or even Jewish museums. Levana Zamir comments: Slowly but surely all our holy sites and private property are becoming Egyptian property. Magda - she is the only witness to the mess she claims the community's archives were in - has turned over all the community's documents and registers to the Egyptian authorities. The Alexandria community did the same. The Nebi Daniel Association has been fighting to obtain copies of the Jewish registers for 16 years. This is important for those who need to confirm their identity as Jews. But Magda, and Carmen before her, flatly refuse to release photocopies, and this is very sad. (Sixteen US senators have sent a letter to President El-Sisi, so we live in hope.) American money has been donated for the preservation of antiquities - Pharaonic, Coptic or Jewish - and the Egyptian government has the right to spend it as it wishes. Magda's fundraising drive is unnecessary, as private Egyptian donors are ready to help preserve and restore Jewish sites. See Preserving traces of Egypt's lost Jews - but for whom? Her leanings and sympathies are all too clear. She will sell you hope in exchange for money. Not letting us have photocopies of our records is beyond the pale, as there is absolutely no reason for it. If you needed an additional clue, here it is. for further tributes. She deserves better than that kind of slanderous article.